Pupils from a primary school in north Wales have got in touch with their creative side to highlight the problem of dangerous parking outside their school. 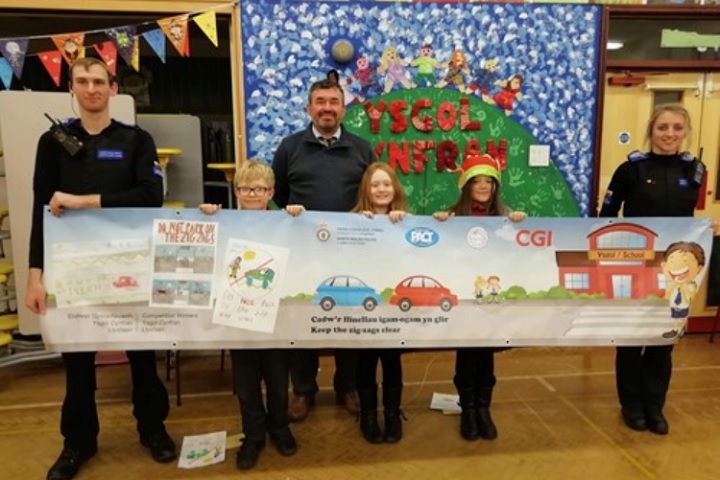 Working with North Wales Police, pupils at Ysgol Cynfran School in Llysfaen recently took part in a poster competition to educate drivers on the pitfalls of of parking on zig zags. The winning posters have been printed on a specially designed banner, which is now on display outside on the school gates. Owen Rogers, the school’s head teacher, says he hopes the banner will remind parents to think twice about where they park. PCSO Matthew Preston, from the local Safer Neighbourhood Team, worked on the project and says pupils and staff wanted to take action following a near miss involving a child and a car outside the school. PCSO Matthew Preston said: “The issue of vehicles being parked on the zig zag lines has been problematic. A minority park illegally and inconsiderately, so when the school highlighted the issue we decided to do something about it. “We decided it would be a great idea to get the whole school involved so we came up with the idea of asking the pupils to design a poster. They were tasked with the job of asking parents to help them with their designs. Action or rather prosecution can only take place if there are not only the zig zags lines outside the school grounds but there are also specific yellow coloured ‘no stopping/waiting’ notices situated to warn driver not to stop or park, being displayed. Without such signs no offence of stopping/parking outside the school is committed but a police officer can have a word with the driver and warn him/her of the dangers. Its amazing thought just how many parents mistakenly believe that the lines are actually there for their benefit, to actually stop and let off or pick up the kids. Amazing what some drivers have it on their minds. No mention of issuing penalty notices to offenders or even the PCSOs talking direct to the drivers concerned?